Sowed poison salt on open wounds. On the 24th of June 1941, the Germans conquered Vilna and established a joint administration with the Lithuanians. 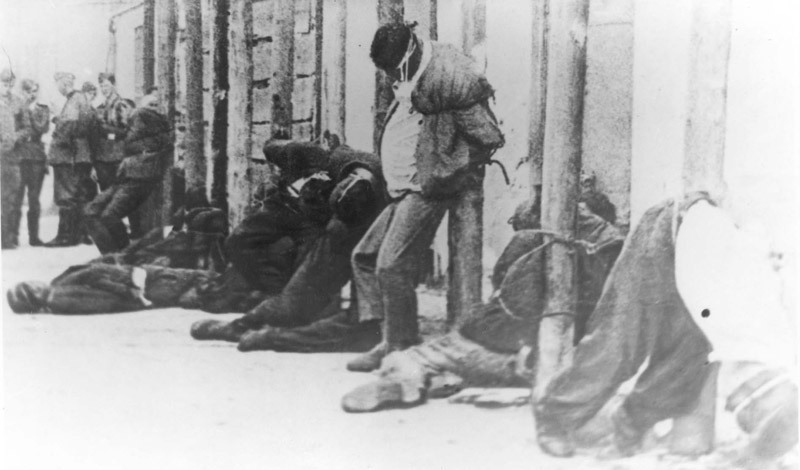 The Lithuanians murdered dozens of Jews and the Germans kidnapped many Jewish men for work; not all of whom returned. Lithuanians searched the Jews for weapons and stole items of value. Jews were dismissed from employment and in grocery stores, special Jewish queues were established, from which most left empty handed. 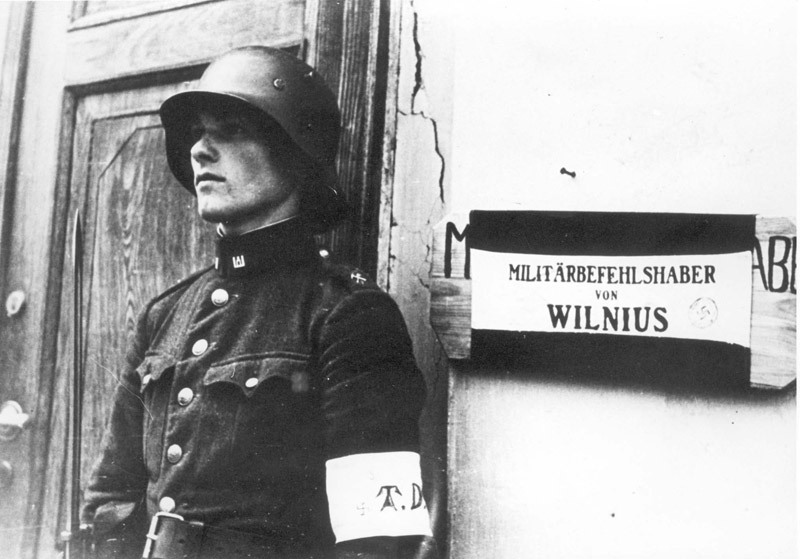 On the 2nd of July 1941, Vilna was subjugated to German military rule and mass murder of the Jews of Vilna began. The Military Administration required Jews to wear yellow badges and later, a white arm band with a yellow Star of David and the letter J (Jude). Jewish movement was restricted, property was confiscated and Jews were drafted for forced labour. A Judenrat was established and the Jews were forced into ghettos. On the 4th of July 1941, Einsatzkommando 9 (a unit of Einsatzgruppen B) in partnership with Lithuanians, began shooting Jews in the pits of Ponary, a holiday destination before the war, 10 km from Vilna. 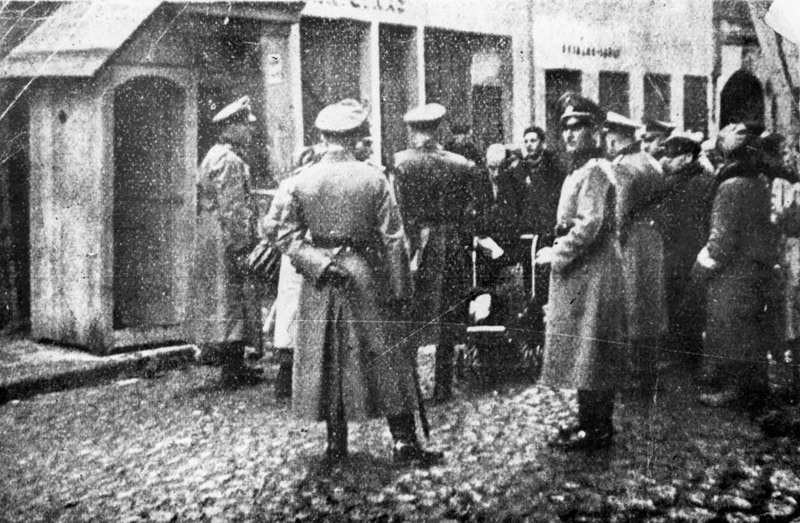 The Jews were kidnapped from the streets, taken to the Lukiszki prison and from there transported to Ponary. When Einsatzkommando 9 left at the end of July, the mass murder was continued by Einsatzkommando 3 (a unit of Einsatzgruppen A) under the command of Karl Jaeger. From July to the end of December 1941 between 26,881 (according to German sources) and 61,898 (according to Jewish sources) Jews were murdered. On the 4th of July 1941, two Germans arrived at the Synagogue on Zydowska (Zydu) Street in Vilna and demanded that the Shamash (beadle), Haim Meir Gordon, establish a Jewish representative body to present to the Germans the following day. Gordon turned to the previous Community Secretary Israel Verblinski and that evening he convened a meeting of public figures that represented the various parties and organisations. On the 24th of July the Judenrat was established with twenty four representatives under the leadership of Shaul Trotzki and his deputy Anatol Fried. 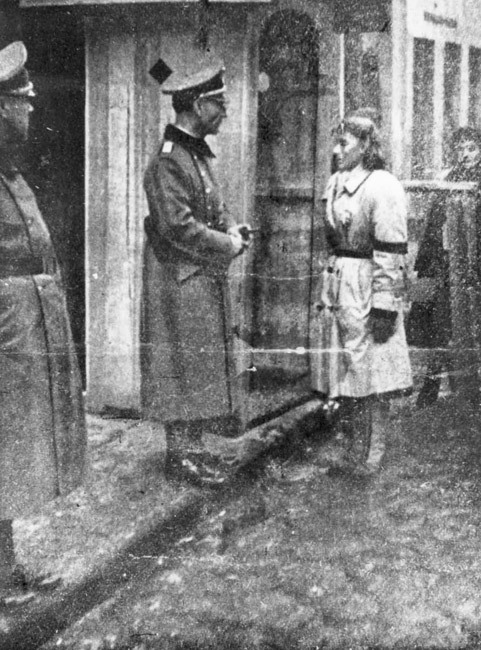 The reins of power in Vilna were yielded to the German Civil Administration. On the 2nd of August 1941, the authority issued an order requiring the Jews to wear a yellow Star of David and forbidding them to linger in public places or to use public transport. On the 6th of August, Franz Murer, who was responsible for Jewish affairs in the Civil Administration in Vilna, imposed a fine (tribute) of 5 million rubles (500,000 Reichsmark) on the Jews of Vilna, to be paid by the following day. They succeeded in negotiating a postponement and over course of the coming days the Jews collected money and valuables, giving him 1,490,000 rubles and 16.5 kg of gold and watches. On the 12th of August, an additional decree was issued with regards to the markets: Jews were permitted to shop only during the hours of 4-6pm. On the 17th of July 1941, an order was published announcing that in Eastern areas where fighting had ceased, power would be transferred from the Military Administration to a Civil Administration. 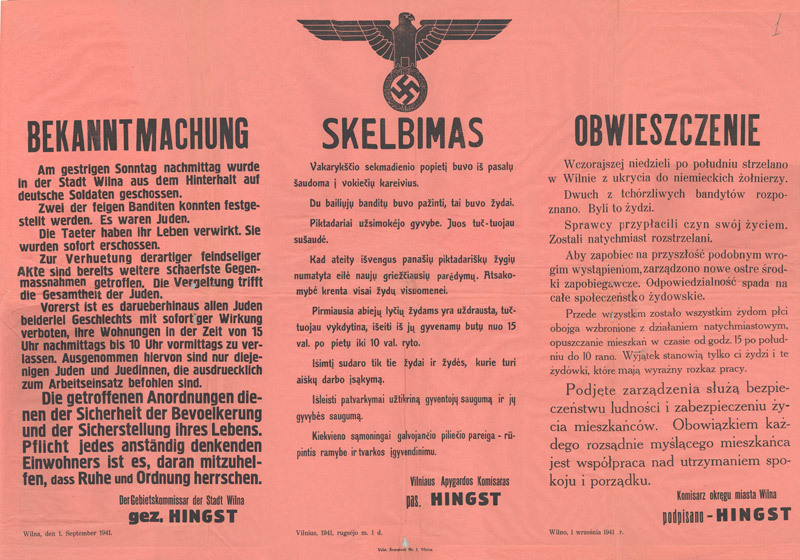 Hans Christian Hingst was appointed as the Gebeitskommissar (Head of the Civil Administration) of Vilna. His adjutant was Franz Murer who was also responsible for Jewish affairs.